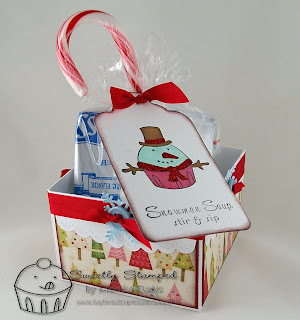 I think my favorite Holiday cuppie is the cute showman from Home Sweet Home! My son and I have been making little snowman soup treats for his classmates and I though I would make my own version for the teacher. 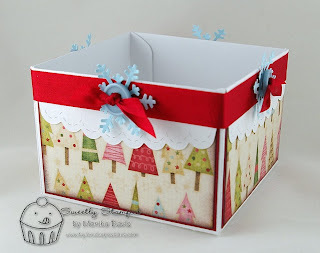 I put a box together made out of the Scallop Envelope Bigz diecuts (Sizzix by SU!). I cut 4 envelopes and attached the flaps to form a box. Then I decorated it using designer paper from the Christmas Key Ingredient pack. I also added satin ribbon (Martha Stewart), punched out snowflakes (Martha Stewart) and buttons. 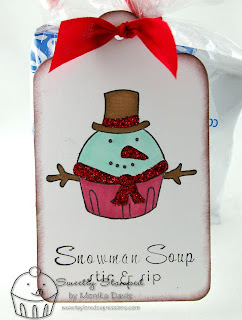 The tag was super easy to make... just stamped the snowman and the 'greeting' (Tag Treats stamp set) on the pre-cut tag (also from Taylored Expressions)... colored the cute snowman with Copic Markers... added the glitter... and finally sponged the edges. Very cute little box! Love the tag too. Monika, this is just adorable! What a cute little box!